I was lucky enough to have receive a package from my good blogger friend Pamala from Addikited2Fashion which included two shirts from MNG, this one shown above and the Last Night a Blogger Saved My Life shirt, and a package from INPINK on the same day. Both t-shirts work perfectly with the two INPINK necklaces. 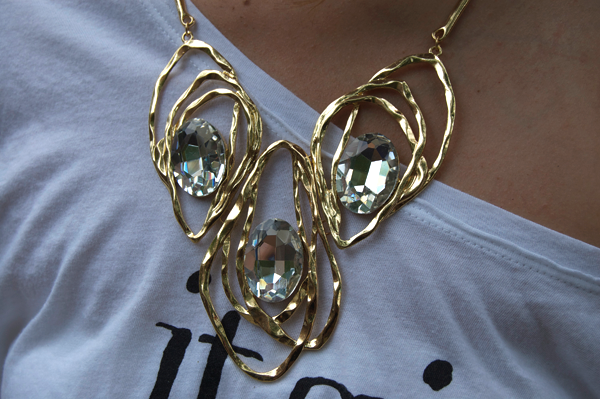 These necklaces are bold but can be dressed super causally with graphic tees and shorts for a total weekend wear look. oh i like everything on this outfit! the necklace is great,so are the shorts,the tee!! casual chic; love it! anddd I NEED that tee! Love this whole outfit so much, it's so effortless! You can never go wrong with a good graphic tee & the necklace is such a showpiece, it adds just the right amount of detail. That necklace is so interesting and stunning, i haven't seen another quite like it. Looks really nice with a simple t-shirt and denim combo too, really stands out. As does that gorgeous vibrant lipstick! Love it! loved how you styled this pair of shorts! that top is really cool but I adore the entire look!